Naming: The Steadfastᵀᴹ Series of Heucheras from Steadfast Plants, LLC have a minimum requirement of thriving for at least five years in my garden in Central Iowa. Heuchera ‘Mary’ has met this criterion and is named after my Mom. She is steadfast. This variety is not patented. 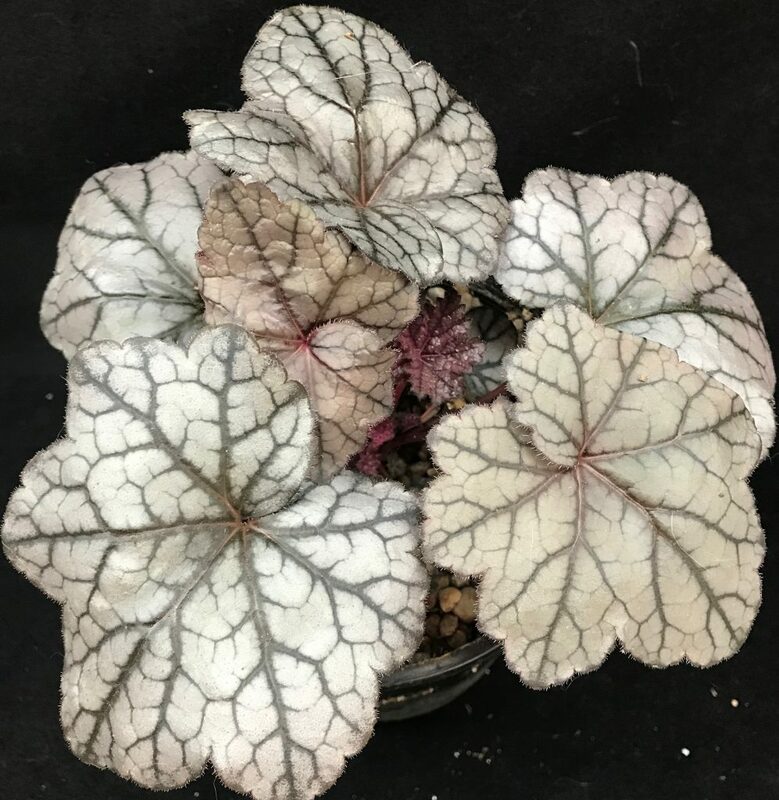 Pedigree: The exact pedigree of Heuchera ‘Mary’ is unknown because the maternal lineage was derived from field grown plants open-pollinated in the early 2000’s. One selection from these crosses was given the pet name of “Pretty in Pink’ — for it’s dark foliage and pink flowers in July. ‘Pretty in Pink’ has thrived in my garden for at least nine seasons. A portion of the maternal lineage of ‘Pretty in Pink’ derives from Heuchera villosa seedlings from seeds collected in Middle Tennessee. The silver overlay of ‘Mary’ is most likely a result of using the Heuchera variety ‘Glitter’ as the male parent. ‘Glitter’ did not survive past two seasons in my garden, but I hereby thank Terra Nova Nurseries for the pollen. Pricing: Payment is PWYW (pay what you want). If the band Radiohead can use this strategy, so can I. For reference, new Heuchera varieties cost about $10-20 each online and at retail. But you can pay me $0. Tip me later if it works for you. Or pay now and tip later (😁). 10% of each transaction will be donated to the Iowa Arboretum. I’m biased for this organization because I am on the Board of Directors. And it’s awesome. Availability: As of April 2019, I have about thirty (35) specimens of Heuchera ‘Mary’. Several of these specimens I need to keep for cuttings. I should have several more available for Fall planting in 2019. Plants are available locally only and by request. Email me at theplantsync@gmail.com or contact me at facebook.com/theplantsync. I will not be creating a large inventory because I don’t have a tissue culture factory to make millions of ’em. Larger commercial operations are not interested in this variety, because it looks much the same as others you might see on a bench at Home Depot on Mother’s Day. The fact that ‘Mary’ was also selected for durability and vigor in Iowa is irrelevant to commercial entities because those traits don’t drive commercial sales. So, my nineteen year-old, get-rich-quick scheme of breeding durable, vigorous Heucheras seems a bit flawed from a business point of view (who would have thought). The struggle continues. Perhaps the industry will wake up to the reality of climate change and realize there is a limit to customer’s thirst for new plants that are dead on arrival, or soon thereafter. Climate Change: My intent is to propagate and distribute this variety with the lowest carbon footprint possible. Hopefully, buyers will act as my nursery and let me take divisions in years to come. That way we can avoid flying Heuchera babies around the world and growing them up in heated greenhouses in the winter, and shipping them all over the place (see Open Source Plants).